The Anesthesia Model is a generic representation of mechanical ventilation and inhaled agent administration. It models a semi-closed circuit breathing system. The Anesthesia System employs a pressure-control ventilation mode for positive-pressure ventilation and gas delivery. The model uses a constant ventilator pressure source to drive inspiration and release pressure during expiration. This model provides an important system required for the training and simulation of a complex medical field. A variety of common equipment failures associated with anesthesia machines are available with this system. The results of this system were qualitatively evaluated for all common failures modeled. The results show an excellent correlation with the expected trends. Future work will address the current limitations of the system and development of a more robust Anesthesia Machine. Compressed gas cylinders - These contain oxygen and/or nitrogen for portable use with the machine. Oxygen may also be supplied through a wall port. Vaporizer - Inhaled agents are inserted into the machine in liquid form and must be aerosolized for patient administration. Unidirectional valves - Valves open and close during the inspiratory and expiratory cycles to prevent rebreathing of carbon dioxide. Carbon dioxide absorber - Carbon dioxide is scrubbed from the anesthesia machine circuit using different absorbers. Ventilator - The bellows supplies gas flow to the patient. Tubing - All equipment is connected through tubing that can become tangled or develop leaks if not monitored regularly. Mask - A mask can be placed on the patient's face to supply supplemental oxygen or an inhaled anesthetic. Endotracheal tube (ETT) - This tube can be placed in the trachea through the intubation process for positive-pressure ventilation for a fully sedated patient. These come in a variety of styles and sizes that must be chosen based on the patient. Laryngeal Mask Airway (LMA) - This device has become common for patients with a difficult airway. It combines a silicone rubber mask with a flexible shaft to provide positive-pressure ventilation to a fully sedated patient without requiring intubation. The Anesthesia Machine Model is designed to provide a generic anesthesia machine capable of simulating mechanical ventilation and the administration of inhaled anesthetic agents. 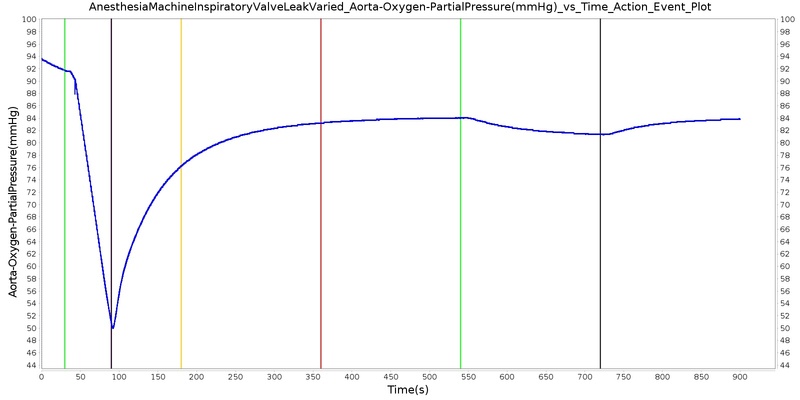 This provides a model capable of powering training simulations designed to practice the use of anesthesia equipment. 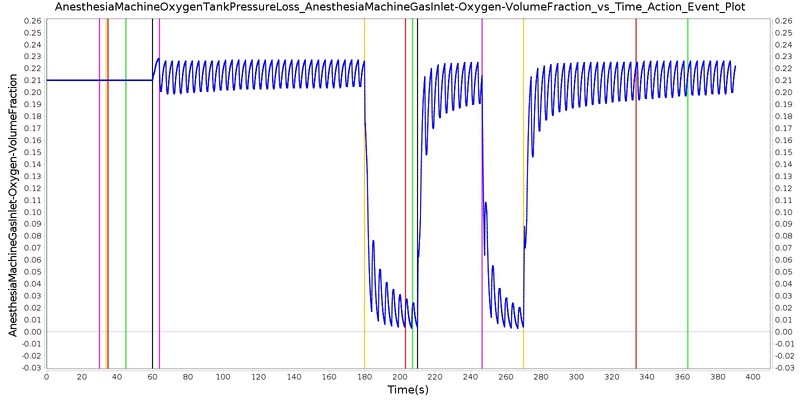 Combining this model with the rest of the engine provides a whole-body approach that allows training of drug administration, airway management, maintenance of anesthesia, transitions from negative- to positive-pressure ventilation, and diagnosis and problem-solving related to equipment failures. The Anesthesia Machine has its origin in the work of Dr. N. Ty Smith and colleagues at the University of California at San Diego. Their work on this subject can be traced back to a series of cardiopulmonary and drug distribution models that they developed  ,  . For example, they developed multicompartment models of the human physiology and pharmacology that describe the uptake and distribution of halothane  . The early models of the group employed analog and hybrid computers. Later, they developed models on standard personal computers that formed a basis for the screen-based simulator originally known as SLEEPER. This program eventually evolved into an advanced anesthesia simulator called BODY simulation and was distributed by the Advanced Simulation Corporation. The BODY simulation program consisted of the cardiovascular, respiratory, and drug models and formed the basis for the HumanSim physiology engine. As part of the engine, the anesthesia machine system is an extension of the HumanSim physiology engine. The major components that control the gas flow and delivery of the anesthetic drugs are derived from the HumanSim engine. Various modifications, including the integration of the Anesthesia System as part of the closed circuit-based common data model, are done on the current version of the Anesthesia Delivery System. As it stands currently, the Anesthesia System is under development and involves some restriction on its use as described in the Features section below. Future releases will provide a more rigorously tested Anesthesia System that is fully integrated with the respiratory and drug systems. 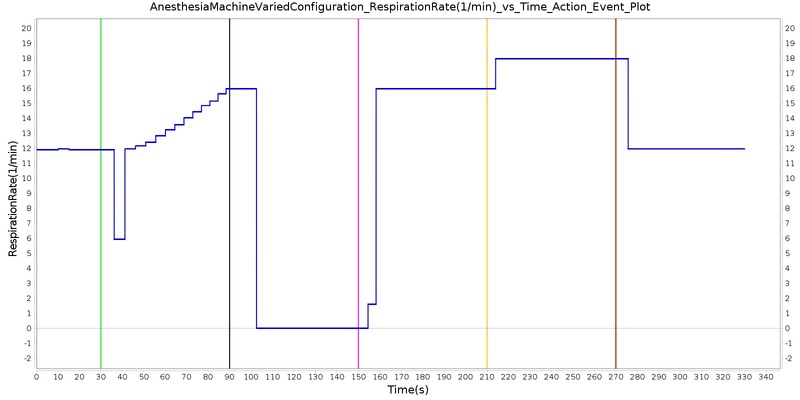 The ventilator and valves operate via time-based cycles based on the settings. There are four phases to each complete cycle, as shown in Figure 1. Figure 1. Flow diagram showing the ventilatory cycles as implemented in the Anesthesia Machine. Process Actions deals with modification of the anesthesia machine parameters and circuit properties due to actions (insults) being specified by the user. The insults are described in the Actions section below. The breathing circuit of the commonly used Anesthesia Machine is comprised of unidirectional valves on the inspiratory and expiratory limbs that control the flow of gases during the inspiration and expiration phases. The Anesthesia Machine incorporates the unidirectional valves using resistors and logical on/off conditions that serve as switches. These resistors are updated depending on the phase of the respiration cycle. During the inspiratory phase of the breathing cycle, the unidirectional valve on the inspiratory limb is opened to flow by employing a predefined low resistance, providing an electrical analogue to a closed circuit. At the same time, the unidirectional valve at the expiratory limb is closed to flow by employing a very high resistance, providing an electrical analogue to an open circuit. The process is reversed during the expiratory phase of the breathing cycle. In addition to the normal breathing cycles, the valve resistances are also modified to model various equipment failures such as inspiratory/expiratory valve leaks and obstructions. In the use of the Anesthesia Machine, there are two basic ventilation modes for precise control of ventilation. These are the pressure controlled and volume-controlled modes. In the volume-controlled mode, the Anesthesia Machine delivers a preset tidal volume to generate ventilation. In this delivery mode, positive-pressure ventilation is delivered at a predetermined breathing frequency and tidal volume to provide predictable minute ventilation. In the pressure-controlled ventilation mode, a set plateau (control) pressure is delivered at each breathing cycle. The tidal volume delivered to the patient is an outcome of the control ventilator pressure and the lung compliance of the patient. The current version of the Anesthesia Machine employs the pressure-controlled ventilator. During each inspiratory phase, a constant control pressure that serves as a driving pressure source is applied to the ventilator. This pressure drives flow across the inspiratory limb path to supply gas to the patient. During the expiratory phase, the ventilator driver pressure drops to a much lower pressure, allowing gas to return to the ventilator. In the engine, the volume of the ventilator is adjusted based on the gas flow into the ventilator node. The gas inlet is modeled as a flow source to add substances to the system - both air and inhaled drugs. 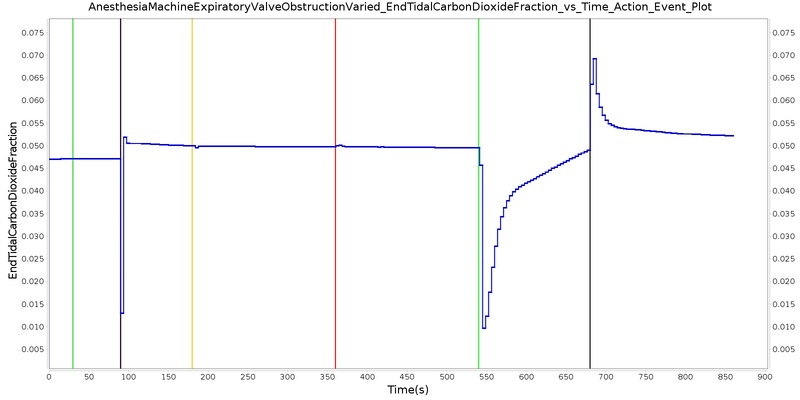 The inlet flow is set by the total flow parameter, and the volume fractions are based on gas source concentrations. The engine calculates the inspiratory and expiratory phase times based on a preset respiration rate and inspiration-expiration ratio parameters that are selected as inputs for the Anesthesia Machine configurations. The current implementation has no specific circuit or transport process functionality for the anesthesia machine. Anesthesia Machine processing is currently done in the Respiratory System with the combined circuit methodology. However, the substance volume fractions and volumes are updated to remove carbon dioxide in the scrubber during this step. The Postprocess step moves values calculated in the Process step from the next time step calculation to the current time step calculation. The current implementation has no specific post process functionality for the anesthesia machine. 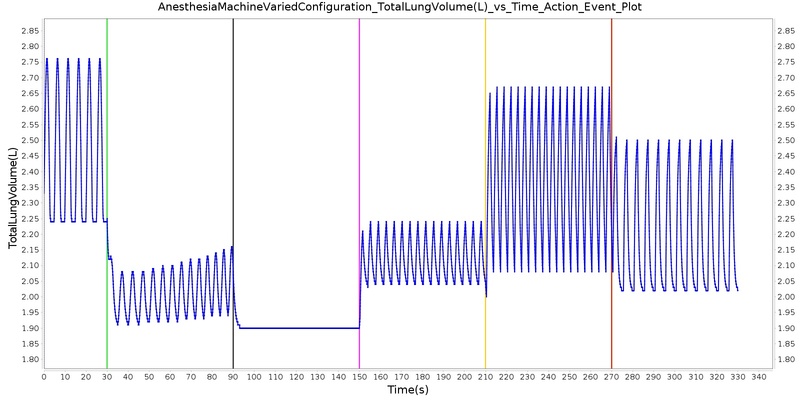 All postprocessing is done in the Respiratory System with the combined circuit methodology. 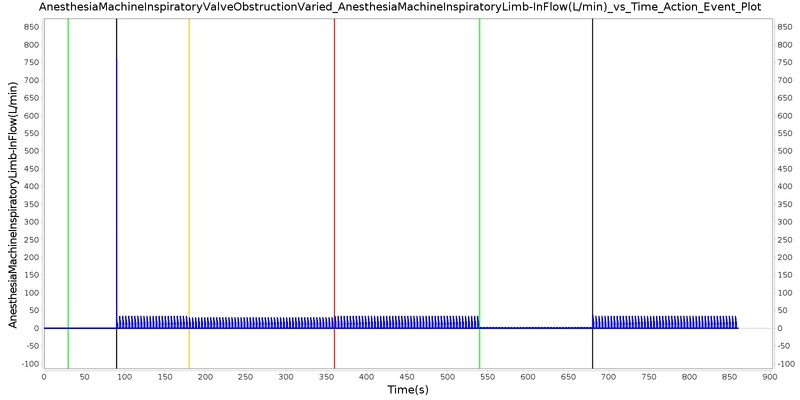 The following figure presents the data flow of the Anesthesia System data processing steps. Figure 2. The Anesthesia Machine system has three processing steps at the highest level. Each time step, Preprocess prepares the circuit to be calculated; Process performs the calculation to determine the entire circuit state; and Postprocess advances time. The Anesthesia Machine System represents a generic mechanical ventilation system. It models a semi-closed anesthesia breathing circuit that employs a pressure-control mode of positive-pressure ventilation. The Model is designed to represent the functions of a ventilator, breathing circuit, and vaporizer of a typical Anesthesia Delivery System. To incorporate these functionalities, the Anesthesia Machine comprises seven major compartments. These compartments correspond to the three flow tubes (the Y-piece and the inspiratory and expiratory tubes), the CO2 absorber, the fresh gas inlet of the breathing circuit, the ventilator, and the mask compartments. The fresh gas inlet allows the flow of volatile anesthetic medications and fresh gas into the breathing circuit. In the model, the vaporizer functionality of anesthesia machines is incorporated by adjusting the concentration of the gas mixture delivered through the fresh gas inlet. In anesthesia machine systems, vaporizers are designed to hold only one specific volatile anesthetic medication. Accordingly, the Anesthesia Model reproduces this functionality by employing conditions that represent left and right chambers, each of which hold a specific inhaled agent. The model treats the agents in these chambers as vapor and mixes them with other gases to be delivered into the breathing circuit. Depending on the amount of oxygen and/or inhaled volatile gases selected, the Anesthesia Model adjusts the total gas mixture to the level of oxygen and/or volatile gases selected. In particular, the model deducts the volume fraction of the nitrogen gas proportional to the oxygen and/or inhaled volatile gases concentration. In this way, the Anesthesia Machine captures the effect of the vaporizer functionality. For delivering supplemental oxygen, the model offers conditions that can be used to represent a separate wall port or an oxygen bottle as options. The model comprises two oxygen bottles that can be used one after the other, depending on the length of anesthesia delivery and oxygen depletion. In the event of endotracheal intubation, the mask compartment is replaced by the endotracheal tube compartment. These two compartments are used interchangeably. The inspiratory and expiratory flow tube compartments are regulated by unidirectional valve switches and allow gas flow into and out of the lung. The ventilator compartment supports positive-pressure ventilation for oxygen delivery and ventilation. Among the remaining compartments, the CO2 absorber canister compartment belongs to an important part of the breathing circle of the Anesthesia System that reduces the amount of inhaled CO2 in re-breathed gas. The diagram in Figure 3 presents the compartmental view of the Anesthesia Delivery System. Figure 3. Compartmental view of the Anesthesia System. The Anesthesia Machine consists of seven major compartments, as shown in the breathing circuit. These are the mask/endotracheal tube compartment, the Y-piece, the inspiratory and expiratory limbs, the fresh gas inlet, the CO2 absorber, and the ventilator compartments. The mask and the endotracheal tube compartments are interchangeable. The unidirectional switches shown on the inspiratory and expiratory limbs permits unidirectional airflow in the patient's breathing cycle. The connecting lines represent the flow of gas between compartments and, the arrows show the flow direction. 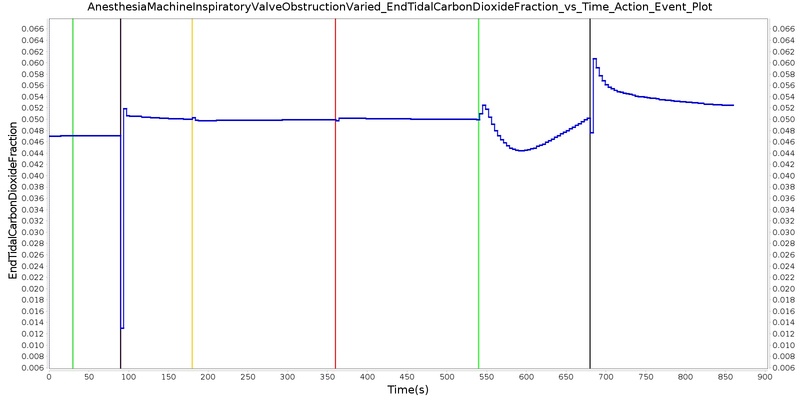 The red lines and the associated arrows in the figure show flow direction during the inspiratory phase. The Anesthesia Machine handles the delivery of anesthetic drug and other medical gases through approaches that allow inhaled gas delivery. The model also consists of a relief valve path that emulates the exhaust scavenging interface. The Anesthesia Machine also interacts with the Respiratory System through a circuit path that links the two systems at the airway node. Compartments in the Anesthesia System are modeled as a network of resistors to account for the resistance to flow through each compartment. The ventilator is designed to accumulate volume on its node based on the flow across its path. When mechanical ventilation is not invoked, the model switches to spontaneous breathing via negative pressure ventilation that is driven by the respiratory muscle pressure. The gas flowing in different Anesthesia Machine compartments is driven by pressure gradients across the resistors representing the flow resistances in the breathing circuit. The flow resistances in the breathing circuit mainly arise from regions in the circuit where there are constriction and unidirectional valves. These regions cause more significant resistance to the flow than the remainder of the breathing circle. Since practically all of the pressure drops occur across these resistors, the circuit diagram (shown below) representing the pressure gradient and the resistance to the flow appear to have a different form from the compartmental view diagram shown above. In the circuit diagram, the mask and the Y-piece are connected together as a single node, whereas a current source at the node represents a leak at the mask. The exhaust represents a leak to the atmosphere or a scavenging system to relieve breathing circuit pressure build up. Normally, the exhaust is connected to a breathing bag reservoir; however, the current version lacks such a reservoir, and the exhaust in the circuit diagram serves as a current source that facilitates appropriate pressure maintenance. Figure 4. Circuit diagram of the Anesthesia Machine. The circuit employs the ventilator as a driver pressure source. 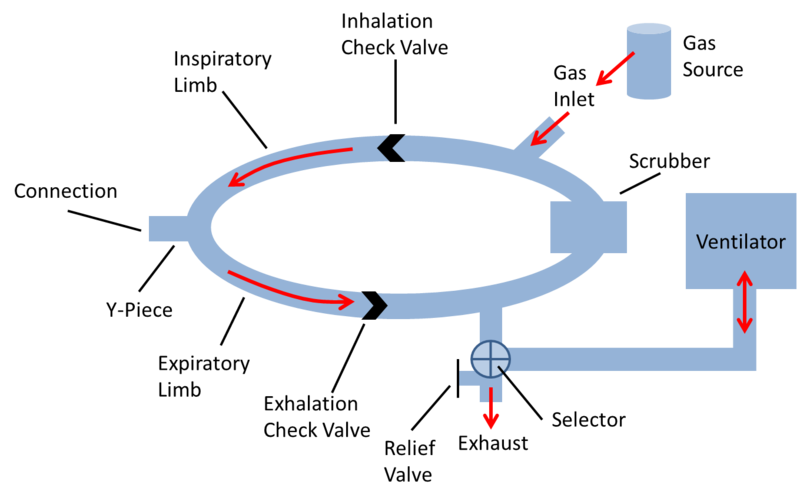 One of the two pressure sources is selected using the switch. The fresh gas inlet serves as a current source that drives fresh gas and anesthetic drugs into the breathing circuit. When the Anesthesia Machine is turned on, the switch between the mask (represented as AnesthesiaConnection) and the mouth node of the Respiratory System becomes closed. The switch between the mask and the mouth node remains open when the Anesthesia Machine is turned off. The unidirectional valves of the Anesthesia Machine are handled by assigning very high resistance on the inspiratory or expiratory limbs depending on the breathing phase. When an anesthesia machine is used on a patient, there is a direct connection that allows air to flow freely between both. In the same fashion, the Anesthesia Machine and Respiratory circuits in the engine are directly connected and allowed to share the same fluid. When the machine is turned on, both individually defined circuits are combined into a single circuit that is then used for calculations. Anesthesia machines operate in a specific mode for positive-pressure delivery. As mentioned above, there are two modes of ventilation commonly used. The Anesthesia Machine employs a pressure-controlled ventilator for positive-pressure ventilation. To achieve this, a set of predefined parameters are selected to control the Anesthesia Machine configuration. The Anesthesia Machine assigns the values of the ventilator pressure, respiration rate, inspiration-to-expiration ratio, relief valve pressure, and positive end expired pressure as input parameters. Additionally, the model assigns a set of parameters to control the fresh gas flow and the various gas fractions delivered to the breathing circuit. Table 1 lists the Anesthesia Machine configuration settings currently used in the engine. It should be noted that the current version of the Anesthesia Machine Model is restricted to the values listed in the table until a wide range of values are tested. 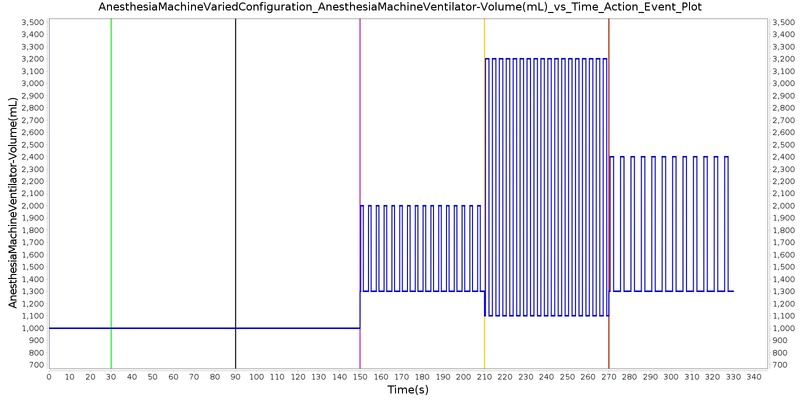 Future versions will allow user-selected Anesthesia Machine setting parameters. The Anesthesia Machine interacts with the Respiratory System through a connection that delivers gases and anesthesia drugs into the Respiratory System (see Respiratory Methodology). The two systems are connected to each other through a path that connects the mouth node of the Respiratory System to the mask/endotracheal node (referred as AnesthesiaConnection in the circuit diagram) of the anesthesia system. During spontaneous ventilation, the mouth node of the Respiratory System is connected to the atmosphere via the Environment System. This serves as a ground node for the Respiratory System. When the Anesthesia Machine is turned on, a network of combined circuits that include the elements from both the Respiratory and Anesthesia Systems is created. When the combined circuit is generated at runtime, the ground environment node connected to the mouth node of the Respiratory System is replaced by the AnesthesiaConnection node that represents the mask/endotracheal node, becoming one combined circuit. Apart from such interaction, the Anesthesia Delivery System is also responsive to the flow resistances of the Respiratory System. In this regard, the ventilator driver pressure serves as a positive-pressure source for the combined circuit. This allows the Anesthesia System to manage pressure-controlled ventilation. For providing air into the breathing circuit, the Anesthesia Machine is linked to the Environment System that regulates the gas concentration and atmospheric pressure. 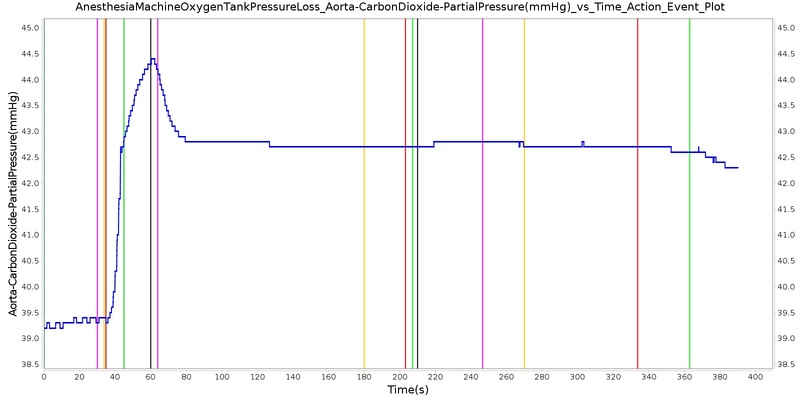 The engine Anesthesia System has system data that allows for selection of the primary gas, e.g., air, nitrogen, etc. Based on the primary gas, the delivery of supplemental oxygen and/or anesthetic gases adjusts the composition and fraction of gases derived from the Environment System (see Environment Methodology). The Anesthesia Machine is a generic model to represent the various components available in the administration of inhaled agents and mechanical ventilation. This system is intended to provide a model that can simulate the response of the body to positive-pressure ventilation, drug administration, and failures of the equipment to provide adequate gas mixtures or gas mixtures of the appropriate concentrations. The model employs a pressure-controlled, positive-pressure ventilation mode and sets a constant ventilator pressure to drive inspiration. Currently, there are two limitations with the model. First, the model does not allow manual breathing using a bag reservoir as a pressure source. Secondly, the current version of the model is designed to deliver a set number of breaths per minute, as expected for pressure-controlled or volume-controlled ventilators. This is necessary when modeling a fully paralyzed patient. However, for anesthetic cases that don't require complete muscle paralysis, a synchronized ventilation that allows a patient's spontaneous breathing would be necessary. The current version of the anesthesia system does not allow synchronized positive-pressure ventilation with spontaneous breathing. Future efforts may be directed towards rectifying this limitation. The Anesthesia Machine can model a variety of different equipment failures. Breathing circuit disconnection is a leading cause of critical incidents in anesthesia   . Disconnections, which are effectively leaks, can be complete or partial. Some of these failures are modeled in the engine by changing a resistance value based on the severity. Figure 5 shows the resistance value that is set based on the insult severity and will be referenced throughout the rest of this section. We have chosen a resistance of 1000 cmH2O-s/L to be associated with a fully open switch (closed valve) and a resistance of 0.001 cmH2O-s/L to represent a fully closed switch (open valve). Intermediate resistances map logarithmically between those two extents. Several insults modify the same resistance that leads to ground (atmosphere) because the change in flow produced by the ventilator reaches the patient in the same way. Figure 5. This plot shows the resistance value that is set based on the leak severity modifier. The severity is mapped logarithmically in a manner that allows the highest severity to allow virtually all flow through the path and the lowest severity to allow almost no flow through the path. Obstructions use the same function with the severity reversed (i.e., 1-severity). 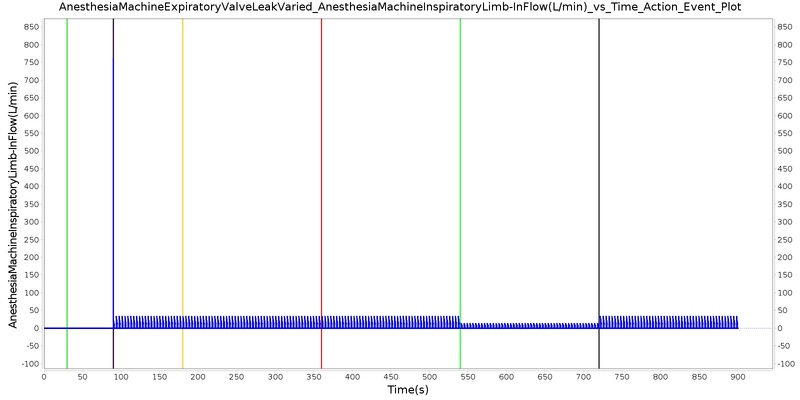 The following three types of leaks are all implemented the same in the Anesthesia Machine code. The mask/tube leaks and the Y-piece disconnect can be called simultaneously, and the severities will be combined. 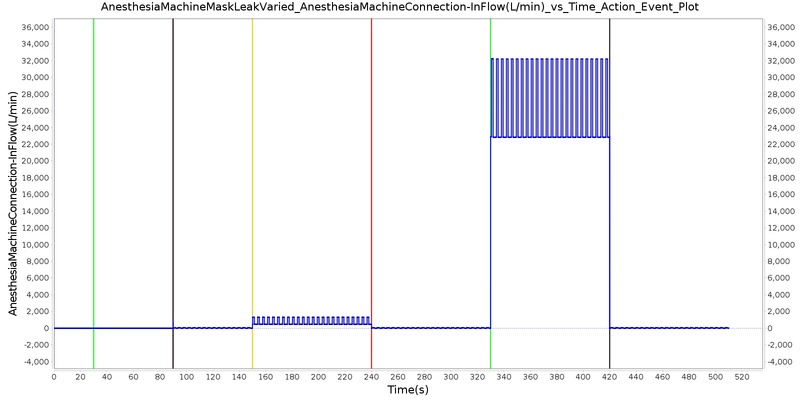 One of the most common equipment failures in the anesthetic delivery system is the mask leak. If a mask is being used on an Anesthesia Machine and is improperly secured or has damage, leaks can occur. The engine models mask leaks by varying a resistance based on the severity in the manner previously described and shown in Figure 5. Endotracheal tube cuff leaks are often caused by a structural defects in the endotracheal tube, but may also arise from improper placement or a failure to fully inflate the cuff. Large leaks can lead to inadequate ventilation. The engine models endotracheal tube leaks by varying a resistance based on severity in the manner previously described and shown in Figure 5. The most common disconnection site is at the Y-piece   . 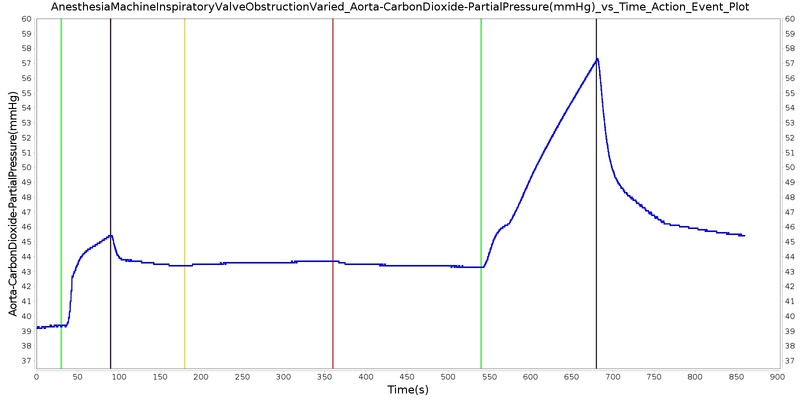 The engine models endotracheal tube leaks by varying a resistance based on the severity in the manner previously described and shown in Figure 5. In the case of both a tube and Y-piece leak, the severities are combined and limited to a total value of one. Inspiratory and expiratory valves leaks are both similar to endotracheal tube cuff leaks. The valves are modeled as resistors that alternate between very high and very low resistance values to mimic a switch opening and closing every breath cycle. This prevents rebreathing of carbon dioxide during the respiration cycle. 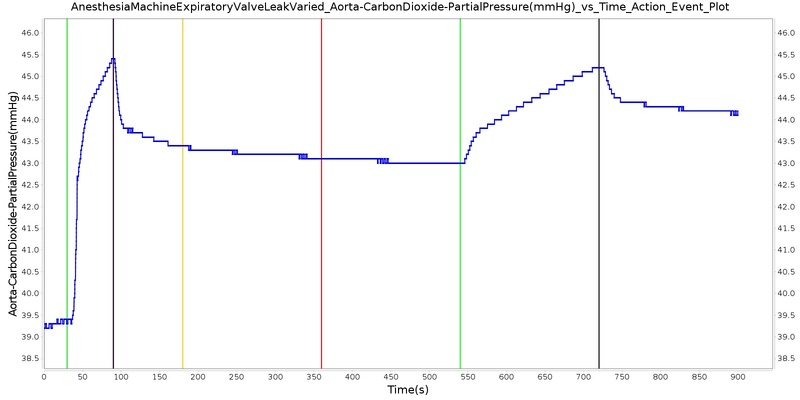 If there is a leak present, the valve closed (i.e., high resistance) value is modified based on the severity in the manner previously described and shown in Figure 5. Anesthesia Machine tracheal tubes can become kinked, and hoses throughout the breathing circuit are subject to occlusions by external mechanical forces that can impinge the flow   . The engine models both inspiratory and expiratory valve obstructions similarly to leaks, by modifying the valve resistance values. If there is an obstruction present, the valve open (i.e., low resistance) value is modified based on the severity in the manner previously described and shown in Figure 5. Both piston and bellows ventilators can sometimes experience mechanical failures that prevent them from filling completely. This causes the driving pressure of the ventilator to be less than the target. The engine uses a ventilator failure severity to linearly reduce the pressure produced by the ventilator, i.e., the pressure source value. The pressure source can range from the full calculated value to a zero pressure. Failure in ventilator pressure may affect the amount of tidal volume delivered to the patient, which in turn reduces the amount of fresh gas delivered to the body, affecting the oxygen saturation level and other physiological parameters. Re-breathing circuits direct expired gases through soda lime granules to remove CO2. To ensure that a soda lime canister (CO2 absorber) is functioning properly, it must be replaced regularly. If it is not monitored and replaced, the absorber will become less effective or completely unable to remove at CO2 from the breathing circuit. 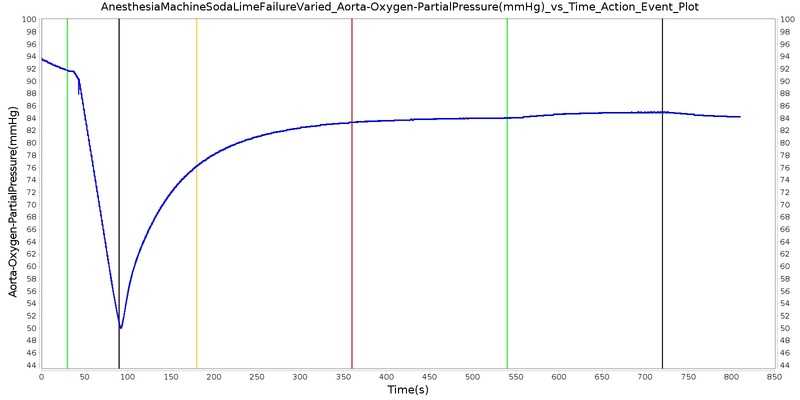 The Anesthesia Machine models soda lime failure by reducing the amount of CO2 removed. 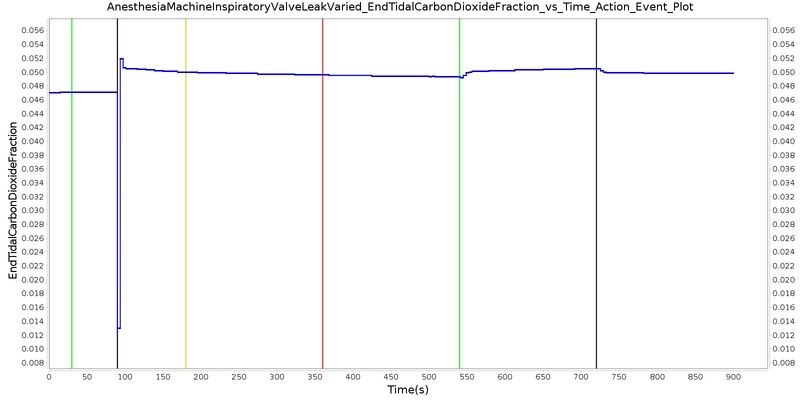 The severity linearly decreases the amount of CO2 removed. Vaporizers in anesthesia machines convert volatile anesthetic medications from a liquid to a set concentration gas for delivery to a patient. Anesthesia Machine vaporizers can fail due to component problems such as leaks in seals and O-rings or electronics failures. The engine models vaporizer failures by reducing the inhaled agent volume fraction at the vaporizer flow source linearly with the severity. Supplemental oxygen is supplied to the Anesthesia System either from the wall source or oxygen tank bottle. Many scenarios, such as a problem with the oxygen pipeline, may cause disruption of gas delivery. To identify these issues, pressures in the gas supplies are often checked. The Anesthesia System attempts to capture such equipment failures by triggering oxygen wall pressure loss and oxygen tank pressure loss conditions. When the oxygen pressure loss conditions are triggered, the model removes the supplemental oxygen delivered to the gas flow inlet by setting the oxygen inlet volume fractions to zero. The Anesthesia system triggers the oxygen bottle tank exhausted event to alert the user of the depletion of each of the oxygen bottles when oxygen bottle is used as a source of supplemental oxygen. The Anesthesia system triggers the Relief Valve Active event to alert the user when the relief valve is closed (closed in the electric analogue sense), and a condition the alerts the user when the pressure has reached the threshold value. The Anesthesia Machine Settings are fully dynamic and do not have any bounds enforced. A scenario that varies these settings in several different combinations is included with the code base and produces the outputs shown in Figure 6. This scenario also tests the relief valve functionality and causes the active event to be logged when the Ventilator Pressure is set too high. Figure 6. 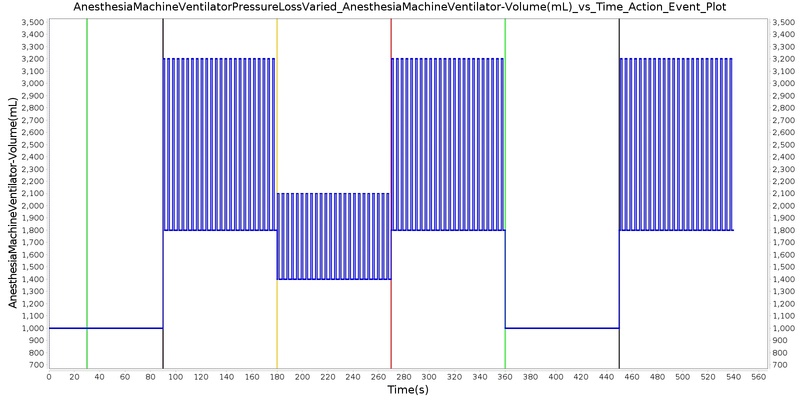 These plots show the successful implementation of varying Anesthesia Machine settings. The first region has the machine connected and provides supplemental Oxygen only. The other three regions are after Succinylcholine is administered to stop unassisted breathing. 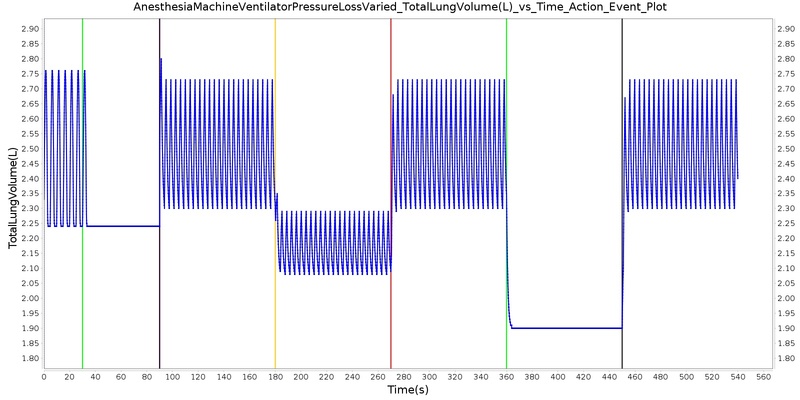 The upper plot shows compartment data from the ventilator and relief valve. 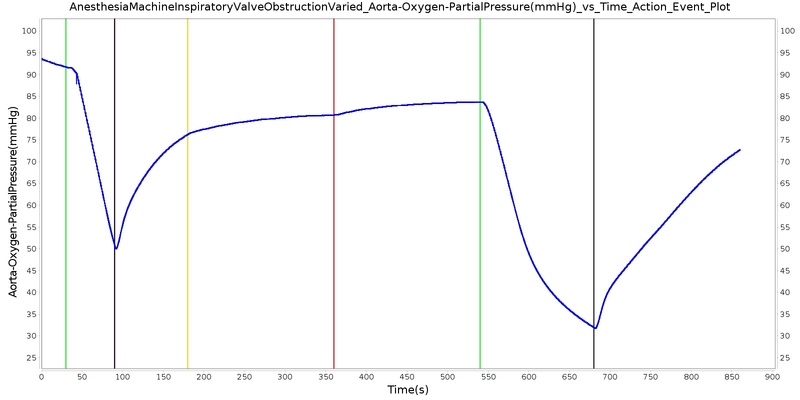 The relief valve is shown to be active by the blue flow plot when the ventilator pressure is set too high. 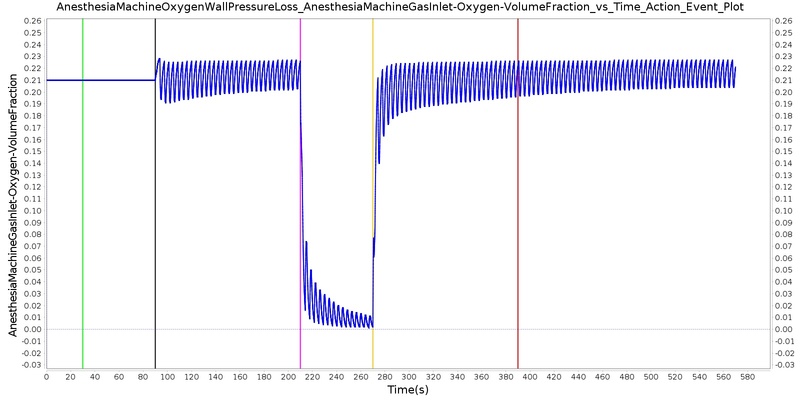 These plots exemplify the interconnectivity of the Anesthesia Machine with the Respiratory System. 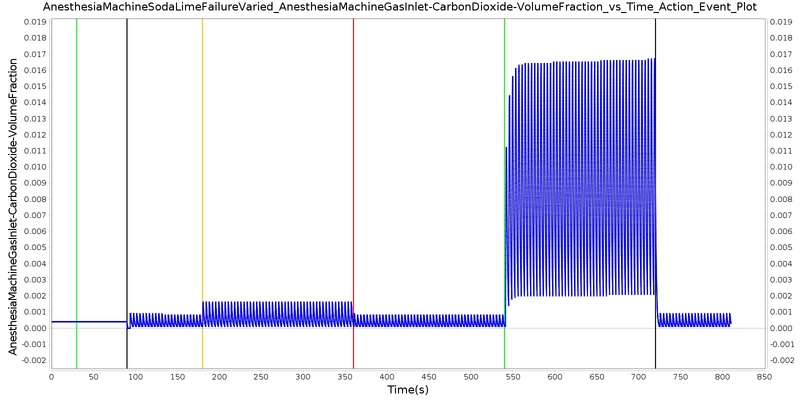 All equipment failures in the Anesthesia Machine system were validated quantitatively where possible and qualitatively elsewhere by comparing the engine output to expected trends and values. For each scenario, the table shows the total number of results in each category. For many investigated scenarios, the model shows good agreement with the expected trends. For the scenarios that did not match with the expected trends, improvements are planned for future engine releases. Table 2. 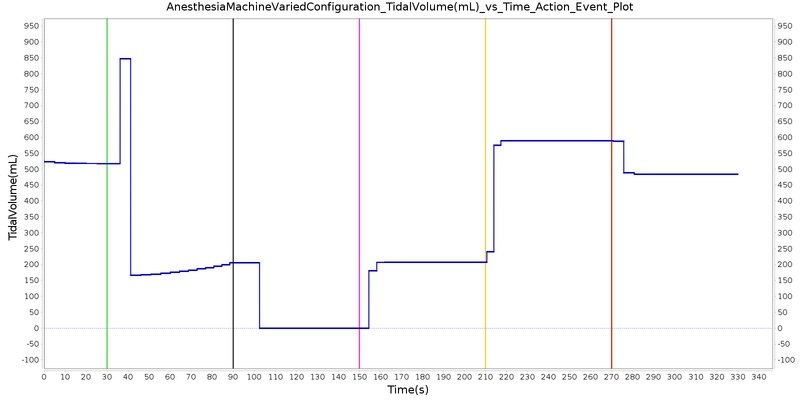 Cumulative validation results for Anesthesia Machine specific conditions and actions scenarios. 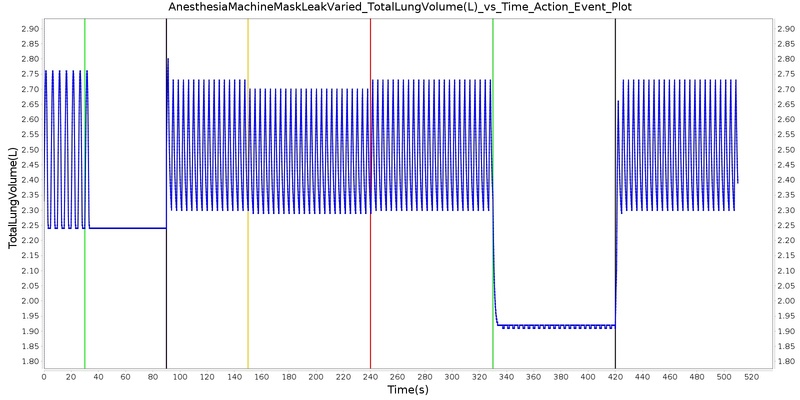 The mask leak, endotracheal tube leak, and Y-piece disconnect scenarios use the same severities at the same times. Since they share a methodology in implementation by modifying a leak reistor, they produce the same results. Each scenario begins by administering a neuromuscular blocker to cause a cessation of normal respiration. Mechanical ventilation then begins using a mask to supply the gas. The severity of the mask leak / endotracheal tube leak / Y-piece disconnect was varied. The oxygen supplied to the patient is expected to decrease with a leak, which in turn causes the oxygen saturation to drop and the carbon dioxide in the bloodstream to increase. This response is more pronounced with increasing severity. Figure 7. Select outputs from the Mask Leak scenario. MaskLeakVaried, EndotrachealTubeLeakVaried, and YPieceDisconnectVaried all give the same results. Table 3. Validation matrix for physiological responses due to varying severities of leaks. MaskLeakVaried, EndotrachealTubeLeakVaried, and YPieceDisconnectVaried all give the same results. The inspiratory and expiratory valve leak scenarios begin by administering a neuromuscular blocker to cause a cessation of normal respiration. Mechanical ventilation then begins using a mask to supply the gas. The severity of the leak was varied. Figure 8. 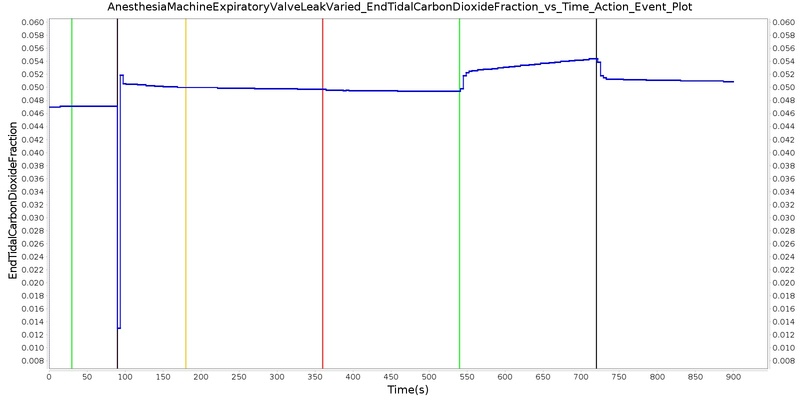 Select outputs from the expiratory valve leak scenario. Table 4. 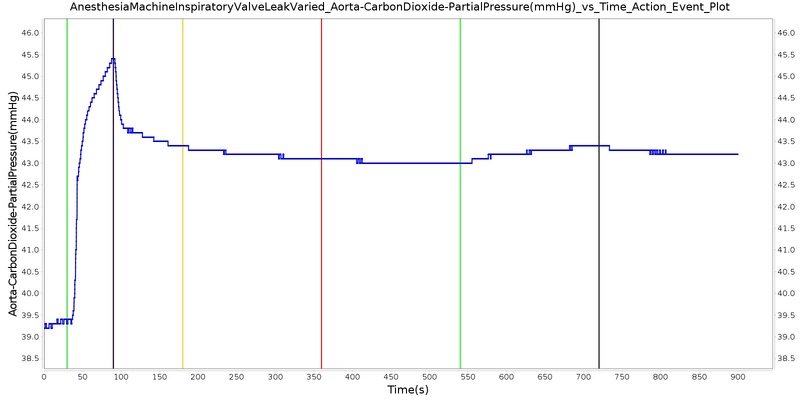 Validation matrix for physiological responses due to varying severities of an expiratory valve leak. Figure 9. 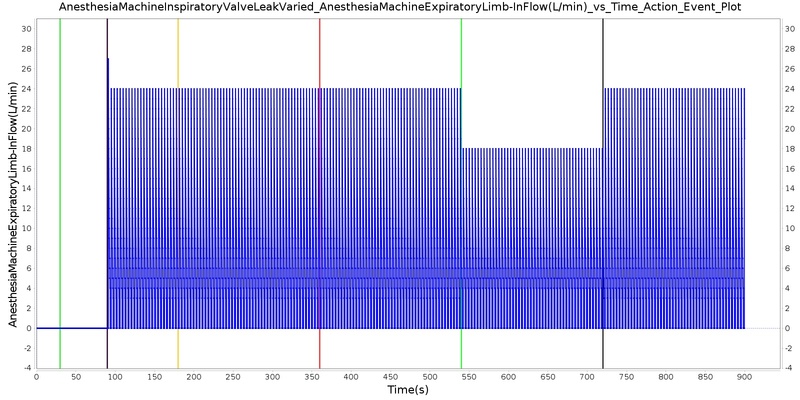 Select outputs from the inspiratory valve leak scenario. Table 5. Validation matrix for physiological responses due to varying severities of an inspiratory valve leak. The inspiratory and expiratory valve obstruction scenarios begin by administering a neuromuscular blocker to cause a cessation of normal respiration. Mechanical ventilation then begins using a mask to supply the gas. The severity of the obstruction was varied. A full obstruction has the potential to cause a complete cessation of respiration or tidal volume due to flow obstruction. Since the neuromuscular blocker freezes the patient's spontaneous breathing, the full obstruction of the valves limits the flow of air that serves as positive-pressure ventilation to inflate the lungs. Figure 10. 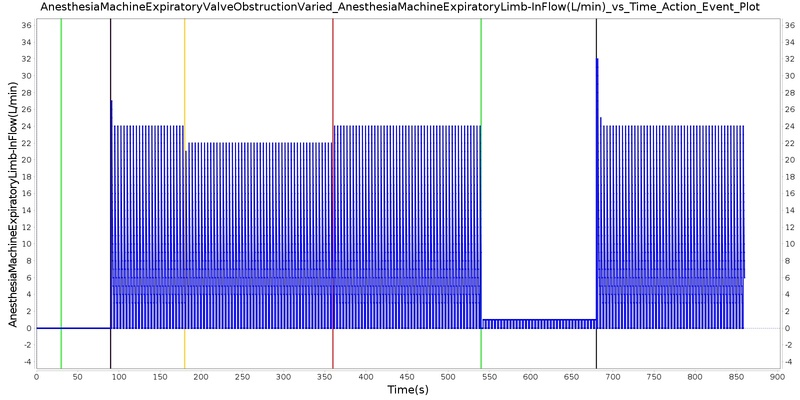 Select outputs from the expiratory valve obstruction scenario. Table 6. 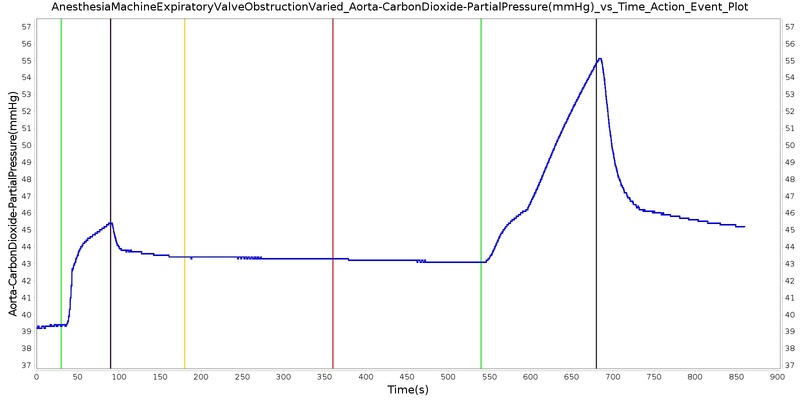 Validation matrix for physiological responses due to varying severities of an expiratory valve obstruction. Figure 11. 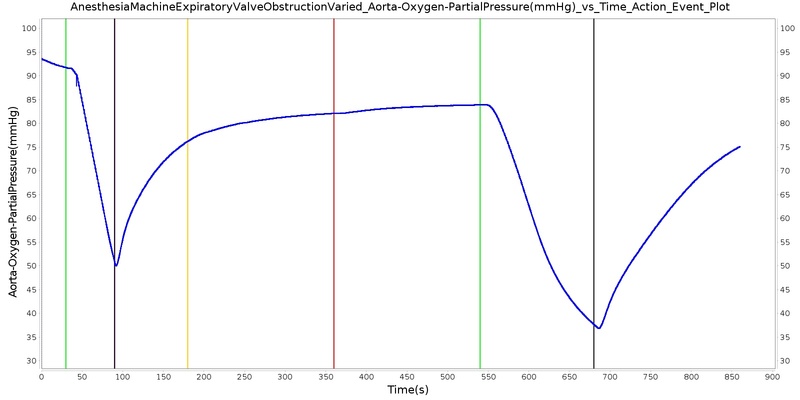 Select outputs from the inspiratory valve obstruction scenario. Table 7. Validation matrix for physiological responses due to varying severities of an inspiratory valve obstruction. The ventilator failure scenario begins by administering a neuromuscular blocker to cause a cessation of normal respiration. Mechanical ventilation then begins using a mask to supply the gas. The severity of the failure was varied. At the full failure, a cessation of respiration was expected. Figure 12. 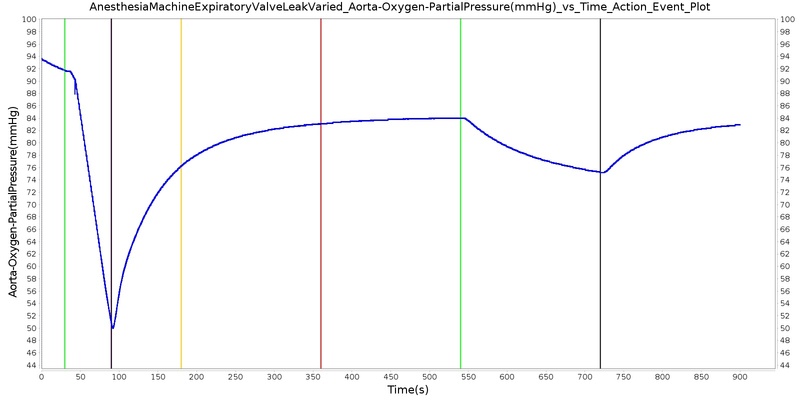 Select outputs from the ventilator pressure loss scenario. Table 8. 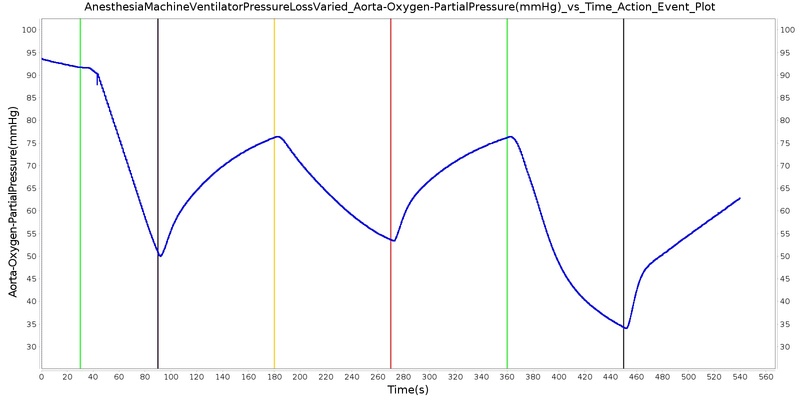 Validation matrix for physiological responses due to varying severities of a ventilator pressure loss. The soda lime failure scenario begins by administering a neuromuscular blocker to cause a cessation of normal respiration. Mechanical ventilation then begins using a mask to supply the gas. The severity of the failure was varied. As expected, respiration rate, tidal volume, and oxygen levels remain stable. Carbon dioxide in the blood increases. Figure 13. Select outputs from the soda lime failure scenario. Table 9. 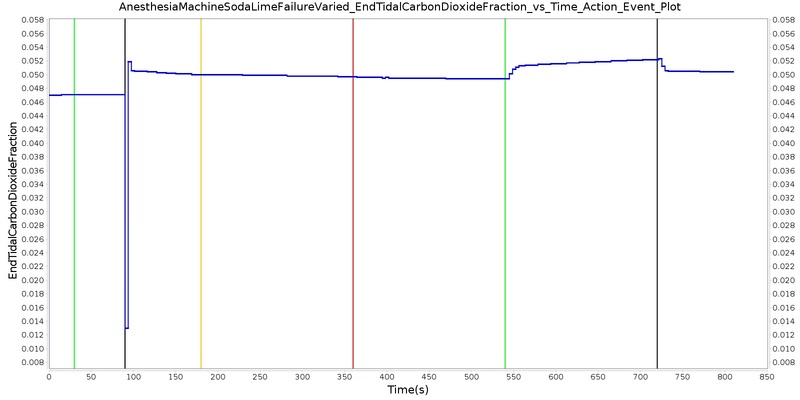 Validation matrix for physiological responses due to varying severities of a soda lime failure. The vaporizer failure scenario begins by administering supplemental oxygen via a mask to the patient. As previously noted, this is a limitation of the system. Mechanical ventilation supplies gas at a prescribed respiration rate, regardless of whether the patient is conscious and breathing naturally. The Anesthesia Machine is then turned on with an inhaled agent, desflurane, being supplied. The severity of the failure was varied. At a severity of one, the vaporizer supplied no desflurane to the patient, and no changes were observed. This was the expected outcome. The drug amount increases in the system and drug effects are observed for all other severity levels. Figure 14. 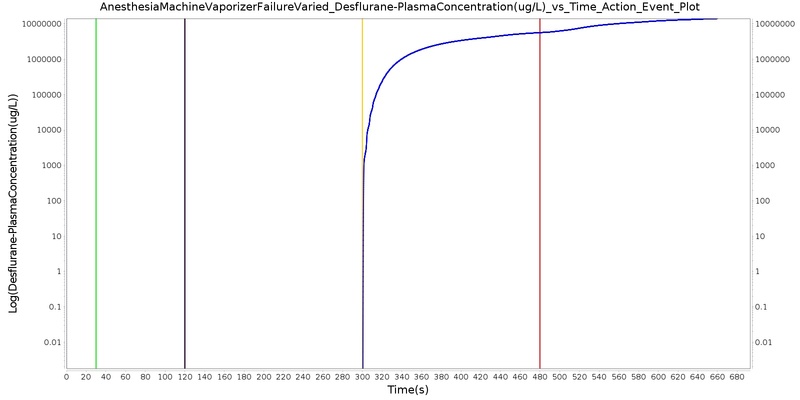 Select output from the vaporizer failure scenario. Table 10. Validation matrix for physiological responses due to varying severities of a vaporizer failure. The oxygen wall pressure loss failure scenario begins by administering a neuromuscular blocker to cause a cessation of normal respiration. Mechanical ventilation then begins using a mask to supply the gas. Oxygen is supplied from the wall source, and the patient is stabilized. 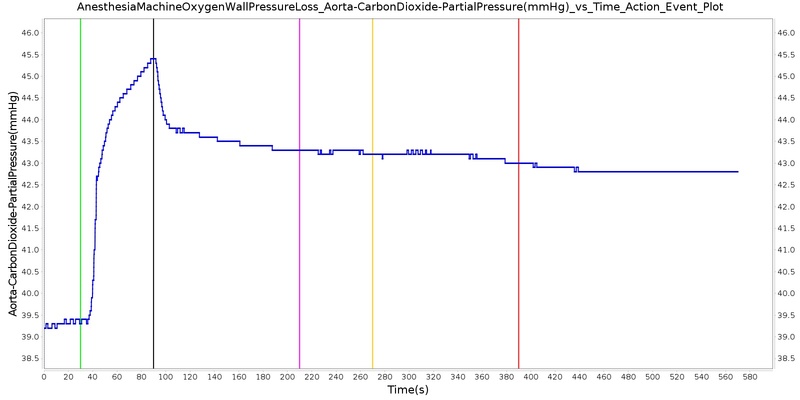 Then, oxygen wall port pressure source loss is triggered, and the physiological responses of the patient are observed. The process is repeated by turning the oxygen wall pressure loss condition on and off, followed by the use of the oxygen bottle tank as a source. The oxygen supply failure due to O2 wall pressure loss causes a drop in arterial oxygen level and a re-supply of oxygen by turning off the failure brings the oxygen level to normal. Figure 15. 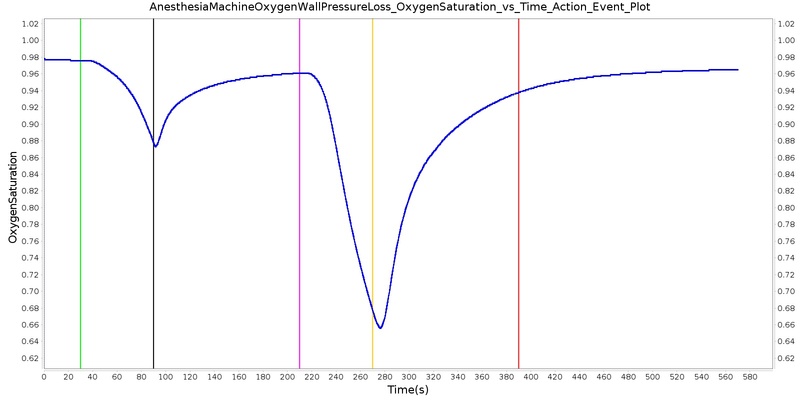 Select outputs from the oxygen wall pressure loss scenario. Table 11. 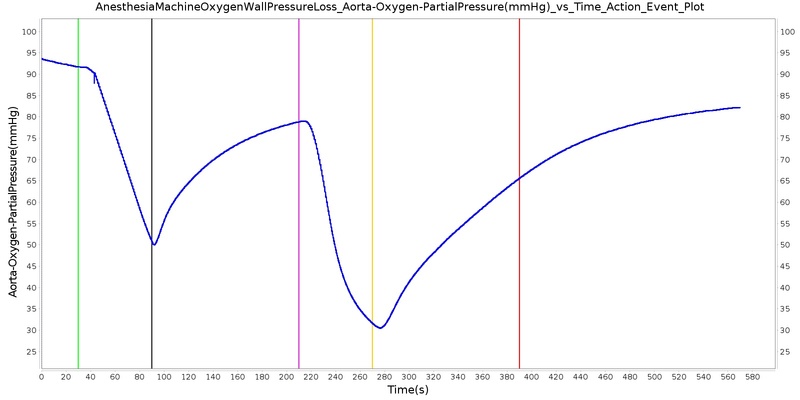 Validation matrix for physiological responses due to an oxygen wall pressure loss. The Anesthesia System has two oxygen tanks as additional oxygen supply sources. Under normal conditions, the model allows selection between the two tanks as substitutes for the wall source. 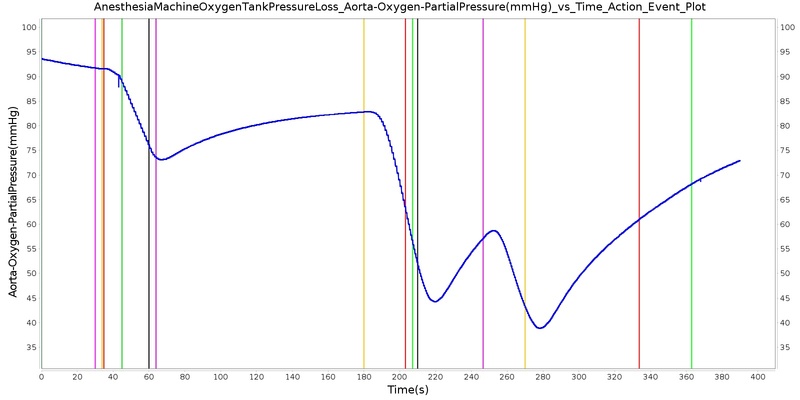 To address the effect of oxygen tank pressure loss, the model employs a scenario that begins by administering a neuromuscular blocker to disrupt normal respiration. 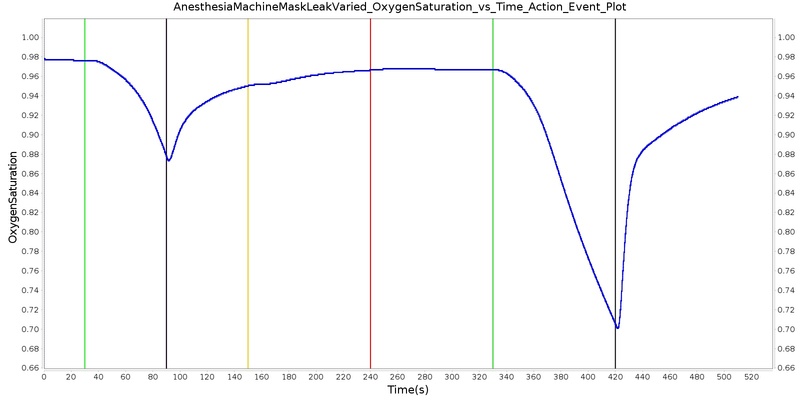 Then, the Anesthesia Machine is turned on, and a mask is placed (similarly to the wall pressure loss scenario), but this time, the model uses an oxygen bottle tank as the oxygen source. The patient is stabilized first for some time. 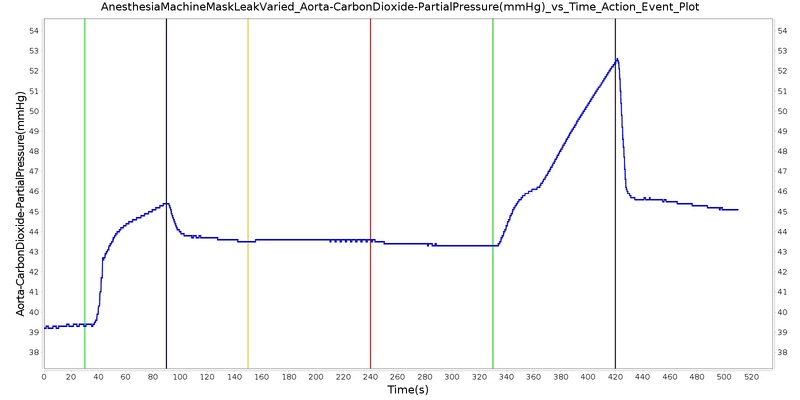 Then, the oxygen tank pressure loss event is triggered and the physiological responses of the patient are examined. The process is repeated by switching the oxygen tank pressure loss state on and off and finally by replacing the original oxygen bottle tank with the second oxygen bottle tank in the model. 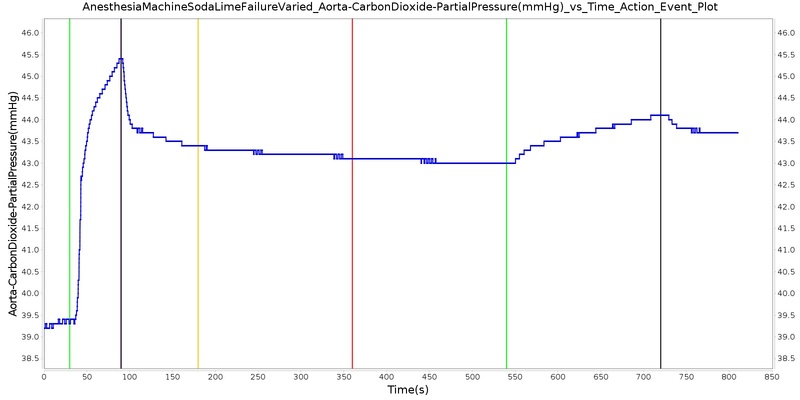 The model responded well to the expected values and showed a decline in oxygen saturation and arterial oxygen partial pressure due to a failure in oxygen supply. Figure 16. 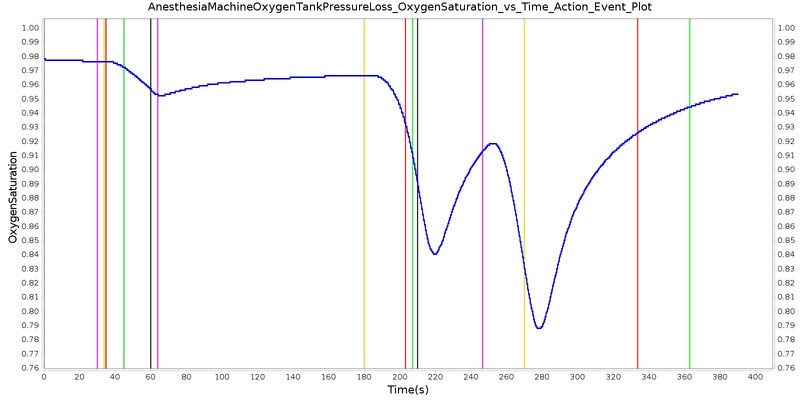 Select outputs from the oxygen tank pressure loss scenario. Table 12. 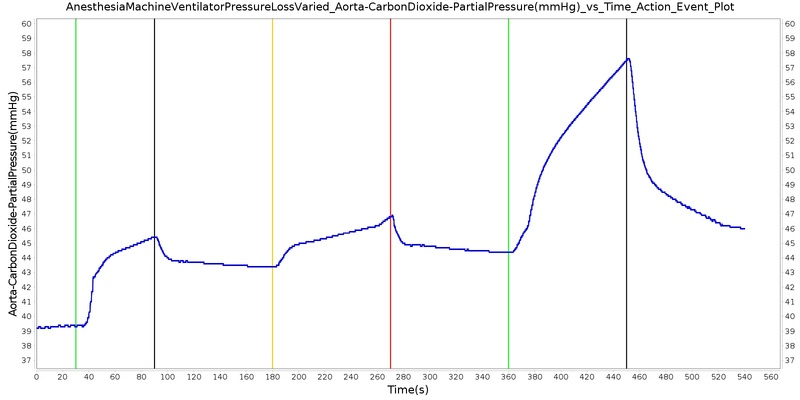 Validation matrix for physiological responses due to an oxygen tank pressure loss. While the model is a generic representation of mechanical ventilation and inhaled agent administration, this model represents the behavior of a complex piece of equipment that is associated with a difficult medical speciality. 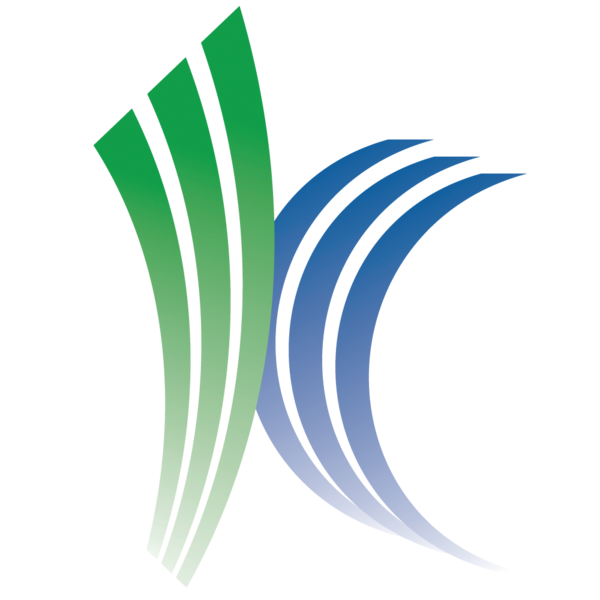 The engine provides a whole-body approach to modelling that allows for simulation of this complex field with multiple steps. This includes common equipment failures and the impacts they have on the body. This system is a strong addition to the engine with the potential for future development. This system has previously been used to power the training application HumanSim: Sedation and Airway, which was funded by TATRC under contract number W81XWH-11-C-0045. The engine modularity could be taken advantage of to add parameters and elements for specific equipment models and manufacturers. Including bag squeeze capability to allow the use of manual ventilation as an additional option will expand the functionality of the Anesthesia Machine system. Further functionality to the Anesthesia Machine system includes the implementation of synchronized ventilation that allows spontaneous breathing along with positive-pressure ventilation.